A job worth doing …. 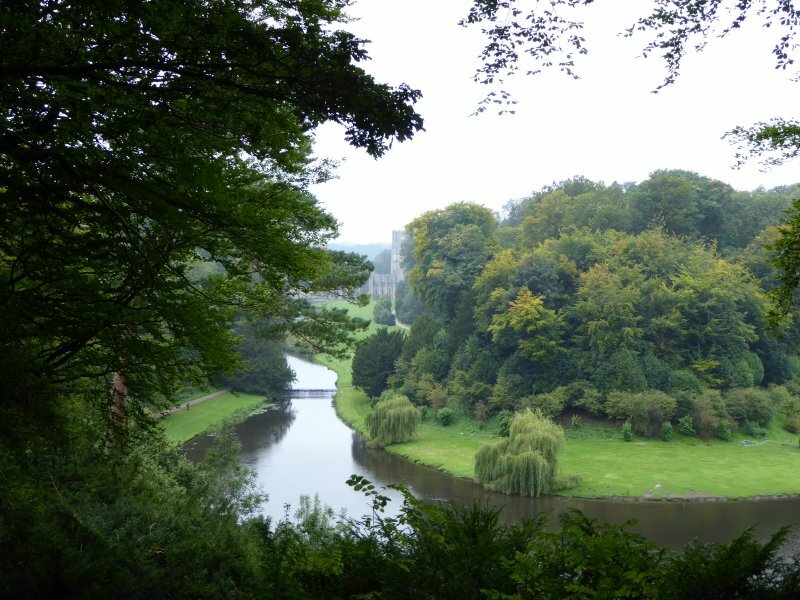 Walk round the grounds of Studley Royal, and this will be your first sighting of Fountains Abbey. A few months ago, I got a job. Not for the pin-money, because I’m not paid a penny. But I’m richly rewarded. I signed up to be a volunteer for the National Trust, at the property nearest our home, Fountains Abbey and Studley Royal. Cistercian Abbey, Georgian water garden and mediaeval deer park…. no wonder it’s a UNESCO World Heritage Site. Since we moved to Ripon, we’d loved spending time there, so I got to wondering….what would it be like to volunteer there? What could I do? What might be involved? The answer turned out to be…almost anything you want There are dozens of different roles, from gardening to guiding. You could drive the mini-bus or form part of the archaeological monitoring team. You could work in the shop, or in the admissions areas. Badged up, you could wander the grounds, being alert to the needs of visitors who’d like a potted history lesson or to find their way to the toilets. You could work in the wildlife team, helping look after and monitor all those ancient trees, or the herds of deer. You could turn to when there’s a special event, and put out chairs. And you’re quite entitled, over the years, to change your mind and try something else. Looking across at St.Mary’s from the Deer Park. But I shan’t be quitting the Learning Team. Our bread-and-butter is sharing a Day In the Life of a Monk with schoolchildren. The children dress up in monk-style habits, and tour the site getting in touch with the brothers’ silent and family-free routines, led by one of the team. 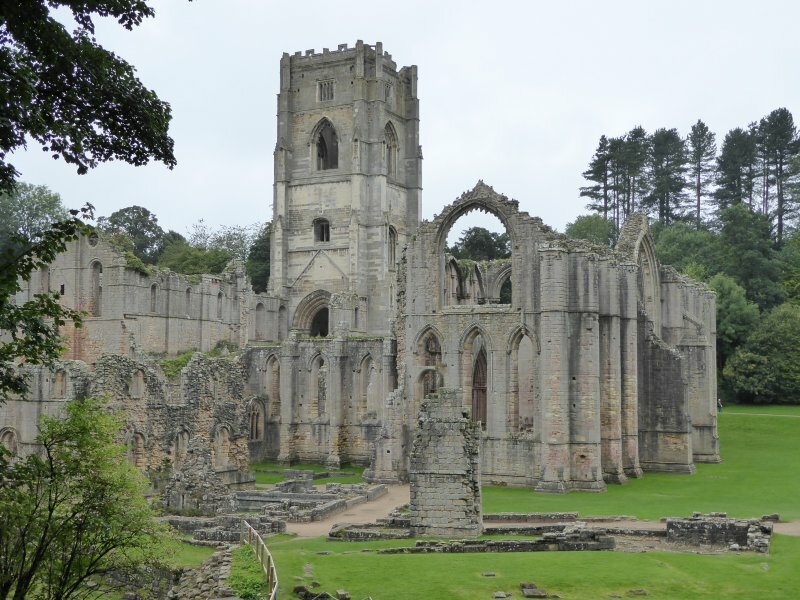 We examine the roofless, windowless Abbey and try to picture the church back in its prime. We imagine the vast space, illuminated only by candles, as the monks worshipped there eight times a day, from 2.00 a.m. onwards. We visit the refectory where the monks dined, in silence, once a day. Did those monks eat meat? What about potatoes? No? Why not? We visit the Warming Room and imagine having just four baths a year, shaving our tonsures with oyster shells. We discuss bloodletting. We talk about all the daily routines. Maybe the children remember only a few of the facts later, But we hope they are moved by these atmospheric ruins, and return later with their families. They might come though, to experience the natural environment of the grounds: they might go pond dipping, or on a walk where they try to use all their senses by listening, touching , seeing, smelling and so on. Or make mosaics based on what they’ve observed. Or go den-building in the woods. They’re as sure of a grand day out as are the volunteers in the team. I’ve ended up doing all sorts of stuff I’d never have thought of attempting. Car park attendant on Bank Holidays? I didn’t think so. But it turns out to be fun togging up in a hi-viz jacket, barking out radio messages on the walkie-talkie system, getting in touch with your inner traffic cop, and generally being a welcome face to visitors as you help them manouevre themselves into the busy car park. And some things are quite simply, a privilege. I wish you could have joined me on Sunday evening. After dark, the site was opened to less mobile visitors. For one night only, cars were welcome on site, to be driven s-l-o-w-l-y past the floodlit Abbey buildings. The evening was cold, misty, moody, atmospheric. Night birds swirled above the trees, dampness dripped from the trees, and monks could clearly be heard from within the abbey, chanting their plainsong (a recording, actually, but none the worse for that). I talked to some of the visitors, often very elderly, as their cars and drivers made their stately way through the grounds. Their appreciation of the staff and volunteers who were there helping the evening to go smoothly, though nice to hear, was quite unnecessary. I wouldn’t have missed this experience for anything. A special evening indeed. And there are other perks. A couple of times a year there’s a ‘works outing’, when volunteers can take a trip to properties in other parts of the country. Here’s one. There are winter lectures for those who want them, to widen and deepen their knowledge of the history of the place There are times to socialise – a barbecue, a quiz night, meals. We’re very well supported, properly trained, and appreciated by the regular paid staff. I look forward to every single thing I do as a volunteer at Fountains Abbey and Studley Royal. I feel very lucky. Wow, Margaret–you make me want to move to England and volunteer–this place looks so marvelous and your experiences are really wonderful. I’ve volunteered, on a much smaller scale, at a historic site and was surprised at how much I enjoyed the whole process, and how rewarding it was. And I have to say, I am blown away by your photos of the Abbey on the one special night! These could be used in brochures! Thanks so much Kerry. I do hope you’ll be able to visit Fountains Abbey and Studley Royal one day. I know you’d find it inspirational. Thanks! But the pleasure’s all mine.